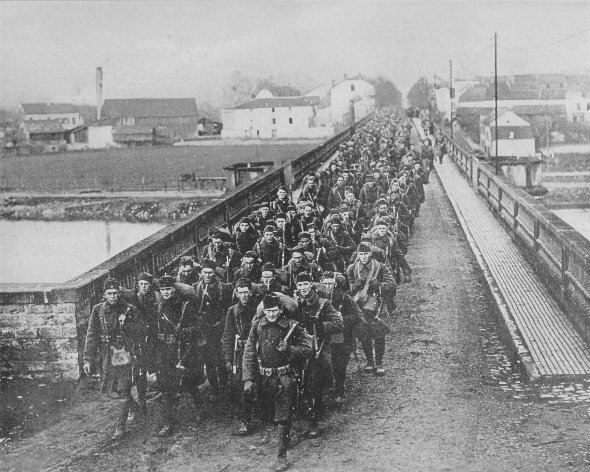 The advance to the Rhine, which began Nov. 17, required long, arduous marches, through cold and inclement weather, with no opportunity for troops to rest, refit, and refresh themselves after their participation in the final battle. On December 1, the leading elements of all Allied Armies, from the North Sea to the Swiss border, simultaneously crossed into Germany. 1st Div. crossing Moselle River at Grevenmacher.